One of my favorite things about seafood is how fast it cooks, and the walnut crust in this recipe literally adds only minutes to the prep time. 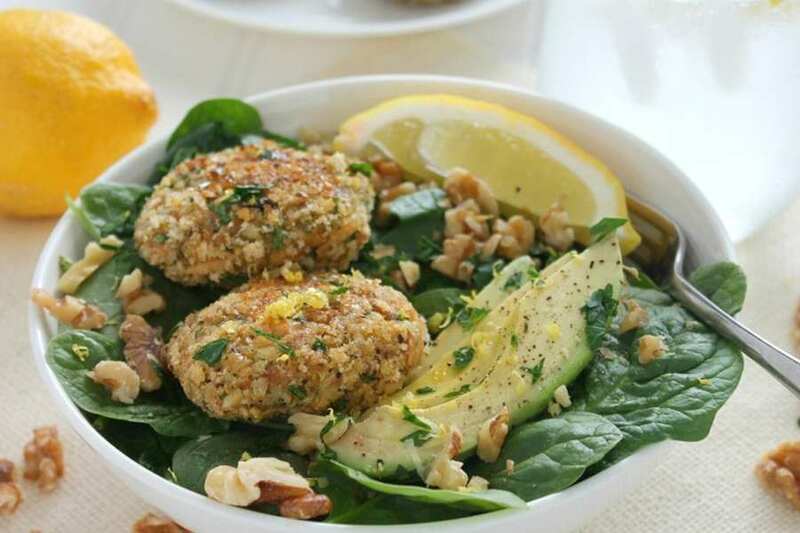 Once you try these Walnut Crusted Salmon Cakes with no bread filler - you will never go back to traditional Salmon cakes! 1. In a medium sized mixing bowl, combine salmon, 3/4 cup breadcrumbs, eggs, parsley, salt, pepper and garlic powder. 2. Spread remaining breadcrumbs and finely chopped walnuts on a plate. Using a 1/4 cup measure, scoop out salmon mixture into your palm and form into patties. Press patties into breadcrumb and walnut mixture to coat on both sides. Repeat with all patties. 3. Heat olive oil in a medium sized skillet over medium heat. Pan fry salmon patties for 4-5 minutes on each side until lightly browned and crispy. Fry patties in batches, if needed. Place cooked patties on a plate. 1. In a small bowl, whisk together olive oil, lemon juice and zest, honey, mustard, salt and pepper. 1. Divide greens, avocado, walnuts and lemon wedges among 4 salad plates. Top with salmon patties and drizzle with vinaigrette. Instead of a salad, these patties may be served atop a toasted whole grain or whole wheat bun or bread with a smear of sour cream or stone ground mustard with avocado, lettuce and tomato – and a lemon wedge on the side. Instead of plain breadcrumbs plus Italian seasoning, you could use reduced or low sodium seasoned panko crumbs.